Our guest today is Andrew Bird. 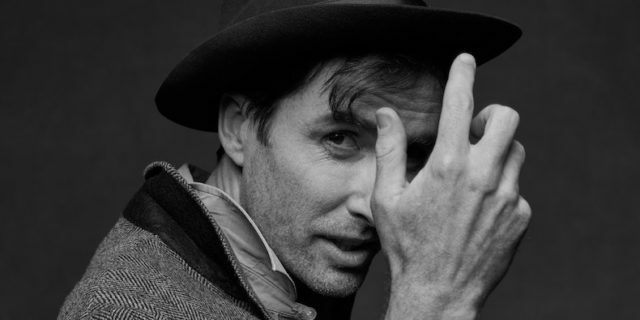 Andrew Bird has been making thoughtful and delightful music for over a decade. His newest album is called, “My Finest Work Yet” and I’ve got to say I agree with him. It is funny, it is thoughtful, it is witty, it is excellent. We’ve been playing the song, “Sisyphus” from the album. Andrew Bird is also coming to town. He’s going to be in Milwaukee on Thursday, September 26 at the Riverside Theater. My guest today is Andrew Bird. Justin Barney: Andrew, what is one song that you can’t stop listening to? Justin Barney: And who is Bobbie Gentry? I honestly don’t know. It’s just a really interesting song and the production and the arrangements are just out of this world. You can tell she’s playing live. Which, of course I appreciate. She’s just playing guitar and singing and then you hear the bass, upright bass behind her. You can hear spatially what’s going on in the room and then there’s this harmonica that was pervasive in the late ‘60s, early ‘70s and these horn blasts that just kind of pop out of nowhere. It’s just something that you could not possibly ever recreate and I’m kind of into that. Justin Barney: I love that. Um, what’s the song about? Andrew Bird: It’s just her, I think she grew up in um rural Mississippi. It’s her as a child begging her father to take her to town and all the things that she would get him to buy her. Song two this week is my pick. One song that I can’t stop listening to is, “Hanging Out of Cars” by Empath. This song is going to sound broken. You’re going to be like, “Justin… Why? Why, pick a song that sounds like this?” It sounds like, it was recorded on a Macbook in 2008 in a basement from across the room. I mean, the sound quality is not great, but I think that’s part of it’s charm. It does sound captured. You know, it sounds like you’re just picking this up and they have this twilight romance about them. When I hear her voice and I hear all the sounds swirling around it I get swept up in this kind of sunset nostalgia that music can put you in. You know, it sets that scene, it lets my brain twinkle. It’s dirty and grimy at the same time. So, it is like this kind of sweetness and also this griminess that I really like about this band and this song. It is “Hanging Out of Cars” by Empath. Our guest today is Grace Weber. Grace Weber is a hometown hero. Though she does not live here anymore, she’s very tight to the city. She started Grace Weber’s Music Lab for high school kids here at 88Nine. She’s been making music here and the now in L.A. for a long time, she is a Grammy Award winner for her work with Chance The Rapper her most recent song “Mercy” features Vic Mensa we’ve been playing it a lot here on 88Nine. My guest today is Grace Weber. Justin Barney: What’s one song that you can’t stop listening to? 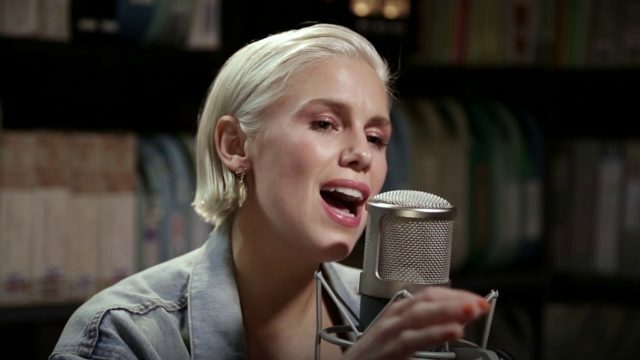 Grace Weber: Honestly, “7 Rings” by Ariana Grande. It’s been on a loop for me. Grace Weber: I was listening to Beats of the Week on Apple Music when I was driving down to San Diego for my bachelorette party and all of a sudden the new Ariana Grande song came on and it just was this moment of like, this girl is crushing it so hard in like, the world; the pop world. Also, just like her vibe is just so on point right now and I also love that like, she’s writing and releasing songs right away and relating to what she’s going through it’s kind of interesting, because I feel we haven’t experienced that. Justin Barney: Yeah, that’s a great point. Justin Barney: And in real time. Grace Weber: And it’s produced so well, but like the video is big. It’s just so weird how like, it seems that she’s slowing down time to be able to accomplish it, but she’s doing it all in real time. Apparently, I’m a big fan of Ariana right now. Justin Barney: So, what is this song about in her life? Grace Weber: Well… “7 Rings” is about um… how she’s like choosing her… I mean honestly I don’t really know, but I think it’s about choosing your friends over like anything else. What I really appreciate about it is the swag. Like, I love seeing a women have this type of swag that’s like, kind of like what you would normally see from a hip-hop artist or something and she’s just coming forth like, you know, “Oh, you like my hair? Gee, thanks, just bought it.” Like, there’s just this swag that I’m really appreciating and I think it’s kind of tight. So, yeah. Justin Barney: I’m here with our intern, Salam. Hello! Salam Fatayer: Hi, how are you? Justin Barney: Good, how are you? Justin Barney: This is your first time on 5 songs, welcome. Salam Fatayer: I’m excited and a little nervous, but mostly excited. Justin Barney: What is one song you can’t stop listening to Salam? Salam Fatayer: So this song is from an EP called “Maba.” It’s called “Roma” by Mah Moud. Salam Fatayer: I told you you would like it. Justin Barney: Yes, my love for the movie “Roma.” Is it related to the movie at all? Salam Fatayer: It is not related to the movie. Justin Barney: Okay, who is it by? Salam Fatayer: It is by Mah Moud and I really it. It’s like a minute and a half song from a 14-minute EP. The entire EP is basically a map of his parents being refugees migrating from Africa to Toronto. Salam Fatayer: So each song is based on a place. Salam Fatayer: Yeah, it’s insane. It’s really great. This one is about Roma obviously and the experiences the family deals with, specifically the parents. I think that is such an awesome idea because you’re basically preserving the experiences of your heritage in such a unique way. It has all of these kind of trademark Cohenisms. And I don’t know if this is what he was going for and maybe you just connect the dots of your own universe and that’s what I’m seeing, but all things lead to Leonard Cohen in this song for me. I mean, it starts off and it’s paired down to the bare essentials. Which, is a Cohen trademark. The drum is just somebody tapping on a drumhead and then it’s got this chorus of background singers that is the accompaniment. Which, is also very Leonard Cohen. The lyrics itself are their poetic “Nothing Sacred / All Things Wild” sounds kind of like the sage wisdom of something that Leonard Cohen would say. And then… There is the kicker. At the tail end of this song he says, “Sorry for poisoning you with my song.” And I thought this is it. That is a… Got to be a direct reference to one of my favorite lines in any Leonard Cohen song from 1974’s, “New Skin for the Old Ceremony.” My favorite Leonard Cohen album. My favorite Leonard Cohen song, “A Singer Must Die.” Leonard Cohen sings, “I’m sorry for smudging the air with my song.” A great line, one of my favorite Leonard Cohen lines and then to have Kevin Morby say, “I’m sorry for poisoning you with my song.” It just seems too close to be an accident. Maybe, it’s just what I’m hearing, but in this song I hear Leonard Cohen incarnate.